Reigning world champion Aled Davies has improved his own F42 outdoor shot put world record to 16.13m at the IPC Athletics Grand Prix in Arizona. 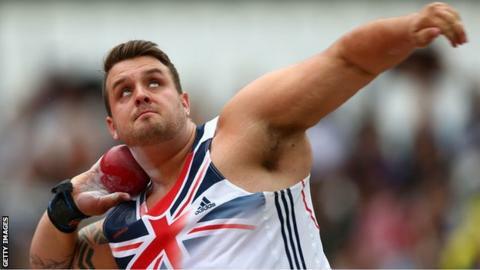 The Paralympic discus champion, 24, beat his mark of 15.93m set last year. Davies threw 16.14m when competing with able-bodied rivals at the British Indoor Championships in February, but that was not ratified by the IPC. "I'm excited to build on that performance and see what I can produce this year," said Welshman Davies. His new mark remains an unofficial world record until verified by the IPC. "The event went well, I came to Arizona for warm-weather training and the competition fitted nicely at the end," said Davies. "It was my first outdoor meet of the year so it was nice to PB even though I was shaking out the cobwebs. "I don't compete much as I'm injury-prone - the plan is to get to Rio in one piece." Davies is set to be named next month among the first phase of Great Britain track and field athletes for the Rio Paralympics. He is aiming to compete in the shot put after his discus event was removed from the competition. The Bridgend man, who has limited functionality of his right leg with missing bones and no muscle or ligament growth, took gold in the discus at London 2012 and bronze in the shot and is the current European and world champion in both events.